Fruit is an essential part of a healthy diet. While it is recommended to eat a few servings of fruit each day, it is also important to note that certain fruits can interfere with the pharmacological action of certain medications. Some of these interactions may have minor side effects, but unfortunately, others may cause side effects, which can be life threatening, or even fatal. The FDA has recently issued a reminder that Grapefruit is one fruit that has the ability to interact with many prescription medications and according to a study one in five Americans eat or drink Grapefruit every day for breakfast. Depending on the type of medication, grapefruit has the ability to either weaken or strengthen its pharmacological action. In other words, it can either result in the drug not working at all or it can cause the drug to be too potent, which can lead to devastating side effects either way. With some medications, the active compound in grapefruit juice (bergamottin) prevents the enzymes in the small intestine from doing their job, leading to a higher dose of the medication being absorbed by the body. This can lead to an overdose, which can be fatal. Other medications are moved into the body’s cells by means of transporter proteins. Grapefruit has the ability to prevent these transporters from doing their job, which can then reduce the effectiveness of the medication. Today, many pharmaceutical manufacturers state that their medications should not be taken with fruit juice. 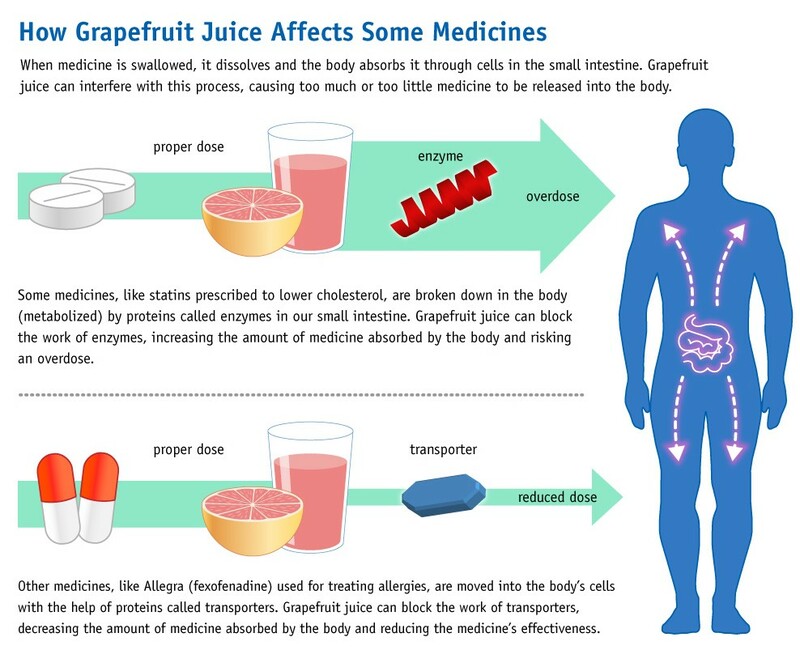 Because of these interactions, the FDA requires certain prescription medications to carry a warning about consuming grapefruit or grapefruit juice during use. It is important to note that these warnings also apply to certain non-prescription medications. That is why it is always recommended that the patient read the package insert that comes with the medication. If no mention is made about grapefruit or grapefruit juice, it is always best to consult with a doctor before consuming it during your treatment. Patients also need to ensure that other foods and juices they consume do not contain grapefruit or grapefruit juice while using certain medications. Statin drugs such as Simvastatin, Lipitor and Lovastatin. Crestor, Livalo and Pravastatin (Pravachol) are not included. Erectile Dysfunction Medications like Viagra (Sildenafil), Cialis (Tadalafil), and Levitra (Vardenafil). Should You Stop Grapefruit Use? If any of the drugs or medications you take are mentioned above then you should talk with your doctor to receive his or hers advice. If your medication is known to interact adversely with Grapefuit, then your doctor may present you with other options. In most cases, though it might be best to cut back on your consumption of grapefruit and grapefruit juice during the course of your treatment. If your medication is not known to adversely interact with grapefruit and grapefruit juice then there’s no reason to stop its consumption, especially since grapefruit is an excellent source fo Vitamin C and can have a positive impact on your heart health. Grapes is good for the heart.But how much calorie does grapes had? -RRB-)were the first things I was getting when I began. You'll need to do a great deal of hoping and image repair work to obtain your sweetheart to even think about trusting you again.